I ordered two quilts, one in blue/one in red, for twin beds in our occasional grandson's room/guest room, and love them both! The colors are beautiful on either side of both quilts, the stars or the stripes. They seem to be of good quality and were packaged carefully. I was looking for a lightweight bedding topper to replace bulky comforters and these are perfect! Give your bedroom some rustic charm with this large star print quilt set from Lush Decor. Constructed from 100-percent cotton, this set is machine washable. 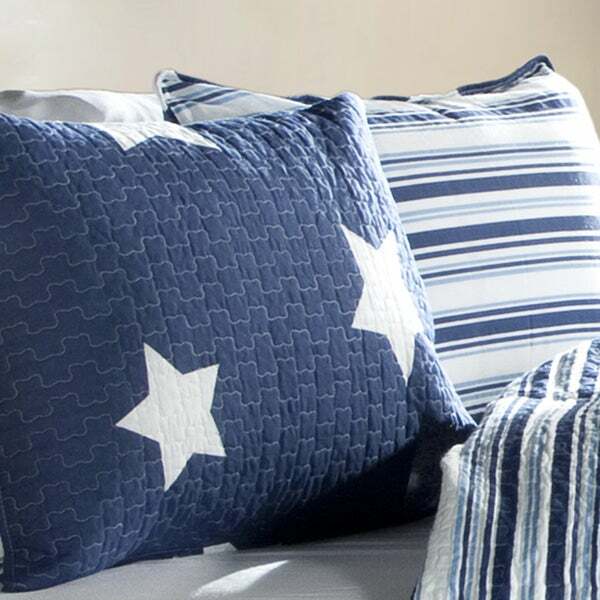 Available in a variety of colors, the quilt and shams reverse to a stripe pattern for even more decorating options. Dimensions 4.0 In. X 11.0 In. X 15.0 In. I ordered this quilt in two sizes for my sons bunk beds. I had read reviews that the color ran once washed and was concerned about quality. I washed the items once received with Shout Color Catchers and had no problems with the color running. The quilts are not as thick as I would have preferred but besides that I am happy with them and they are super cute! 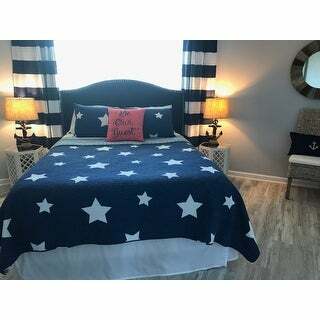 I decorated our boy's room with a red, white, and blue theme and this was a good price compared to the PBK competition! However the quilts are very thin, and when I washed in cold and in accordance to the directions the red color still bled on to the white stars. I love that it came with Shams, but really wish the color didn't rub off on EVERYTHING. Our white sheets are now pink (just from the sham resting on the sheets.) Over all it adds the look we were going for on a budget, and this time... we got what we paid for. This is a beautiful quilt set. The stars theme work for any age.it's a decent quality is well and you can't beat the price. The colors are vibrant I love that the other side of the quilt is a totally different pattern. The shams a good quality as well. Expected to get a quilt that had batting & layers that were truly quilted. Disappointed to receive quilted material that had approx. 1/2 in of poly fiberfill style between two layers of cheap feeling polyester fabric. The stars are stamped on fabric & the sham had red overspray on a white star. The thread count of the fabric was very low grade & the fabric was stiff but not the kind of stiff that seems like it will soften in the wash. Ordered 2 twin sets & they are being returned. Color shades were great--red set was not orangey. Stripes on reverse include espresso brown--cool with gray/black undertones. Quilting thread is white on the red set--while that is good for the stars, it really stands out on the red sections making the set look cheaper. Did not feel like I got my money's worth in quality/appearance when I opened the box & more disappointed to see the stamp flaw on the sham opened. A nice quilt with machine quilting-- good vibrant colors. A little thin, similar in look to a past PB Kids item but not as high quality. Worth it for the price. Not sure if it will fade over time with washing. Used these for bedding in a cabin for kids room. I bought two sets - they are great quality and even after washing a few times the colors are still bright. They look much more expensive than they are. The option to reverse the quilt makes it very versatile. Would highly recommend. Great quilt that i purchased for my son's bedroom. Easy to wash and held up well. Loved the blue and the stars and also that it was reversible! I would recommend this set. This quilt set is darling! We have it for over a year and it washes and dries well. It’s one of those quilts that seems to get even more comfy with each wash! It looks great! Just what I hoped for. Set was complete and we have no complaints whatsoever. What you see is what you get! Love this blue star quilt!! I have it in our new cottage !! It looks adorable!! I have gotten some many compliments!! It is very light weight!! The cottage is on a beautiful lake!! So I love the nautical theme of the quilt!! Bright blue quilt. Love the design too! Perfect for my sons room, love that it is reversible! Great quality for the price. My son loves it in his room. It’s confortable and match the theme perfectly! Couldn’t be happier!!! Light weight cotton. Didn’t expect the pronounced white stitching but still nice. I would highly recommend this Quilt Set. "Sorry my question was not how many pillow shams come with the twin size but rther it the one pillow sham is the star pattern or the stripe pattern. Thank you." Our set came with the star on one side of the sham and the strip on the other. sorry. "stripe" on the other side. Yes, star on one side, stripes on the other. "Does the twin set come with a star or stripe pillow sham?" 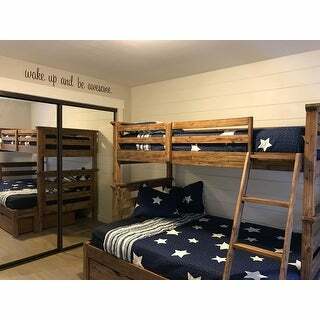 This twin set includes 1 pillow sham. star on one side, stripe on the other. Star on one side, stripe on the other. You can put either one facing out. "What is the fill material on this quilt?" It does not seem to have any. It is very dlat, not poufy. The tag says cotton/poly. "How do I order the accent pillow?" We do apologize, the accent pillow is not currently in stock separately. "is this a true red or is it burgundy ?" Hello tracy, in my opinion, this is true red. Thanks for shopping with us! "can I get a curtain or valance to match this?" Looks somewhat country, but not too much. bright colors for a guest room at the lake.